Hey guys. This short post is just a small update about how I possibly will do the Ocarina of Time walkthrough from now on. I'm thinking about not commentating on the walkthrough anymore (note that this is only for the Ocarina of Time walkthrough, my future ones will have commentary). Before you rush to conclusions, however, take a minute to read the advantages and disadvantages of this decision. So tell me what you think by commenting here or on my YouTube channel, or simply vote your choice in the poll below. Remember, my walkthroughs are for your enjoyment, so tell me how you would like it. Hey guys. Activity has been low recently on the site, but a lot is happening behind the scenes right now. Our YouTube channel is also having plenty of activity, from new Top 10's to walkthrough continuations. Go check it out when you have the time. A big theory that many Zelda theorists talk about is how Ganondorf got into Wind Waker. We all know that he was sealed in the Sacred Realm at the end of Ocarina of Time by the six (seven) sages. Now, according to my timeline theory, after Ocarina of Time comes A Link to the Past. Ganondorf does not reappear in A Link to the Past, but Ganon (his alternate form) did. This may be confusing, but let me explain what I mean. Ganondorf acquired the Triforce in Ocarina of Time, which transformed the Sacred Realm, also known as the Golden Land, to the Dark World (seen in A Link to the Past) because of his dark heart. At the end of Ocarina of Time, Ganondorf is sent to the Sacred Realm, which is now the Dark World. Then, in A Link to the Past, we meet Ganon again in the Dark World, which is where he is trapped. Ganon is the same as Ganondorf, but his form changed as everyone's does when entering the Dark World (for example, Link becomes a bunny). So now we understand what happened to Ganondorf in the Sacred Realm. My theory right now of how Ganondorf broke out of the Sacred Realm is simple. The dark wizard Agahnim from A Link to the Past attempted to eliminate all seven sages into the Dark World. He succeeded in six, which weakened the seal that kept Ganondorf in the Dark World, and eventually, he broke out. Apparently, Ganondorf does not die of age, which is why he survived hundreds of years later, and eventually arrived in the Wind Waker. This is how I think Ganondorf escaped the Sacred Realm and came into the Wind Waker. So, I hope everyone liked the post. Again, I apologize for the the low activity, but I hope I'm making up for it. If you have any questions don't hesitate to contact me using the Contact Us page or just drop me an email at zelda-realm@hotmail.com. I'll be glad to help you out. Oh, and remember to vote on the poll on the bottom left of the page to let me know what you want the next walkthrough to be. Thanks! Hey readers. I have some good news. For those of you who regularly check Zelda Realm's YouTube Channel, you would know that there occasionally Top 10 videos made about different things from Zelda (like songs, enemies, etc.). Well, I added all of these videos to a playlist, and they are now part of a series called "Best of Zelda", where some of the best, saddest, and scariest things of Zelda are made into Top 5's, 10's, and 20's. I hope you guys find this a good idea, so comment your thoughts below! Here it is! Finally, the new design came out! Truth be told, it took me a while to make all of this. I had to redo the whole header, change the color scheme, and do a load of other complicated things, but I'm not going to bore you with the details. This design change was the third major design change The Zelda Realm had, and I think it's also the nicest. Anyways, I want to know what you think. All you have to do is vote at the poll at the bottom of the left sidebar. I hope you enjoy the site's new layout! Hello again, readers! As I have figured out from the comments people put on my last article, it seems that I have some flaws in it. I sincerely apologize for this, as I have not played Wind Waker in a very long time, and I hope I can make up for it with this article. I also cancelled the Great Flood article, as no theory is required for it. Its facts are very straight-forward, and you can read the whole story on Zelda Wiki (you can find it's link in the Affiliates page). 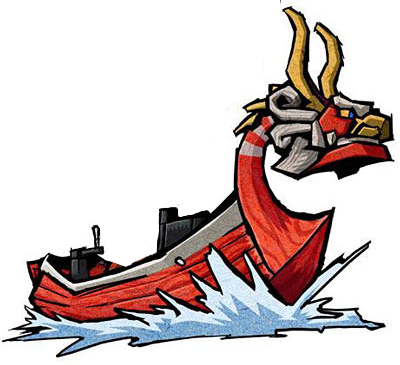 The King of Red Lions is a talking boat that Link sails in Wind Waker. It (he) plays a very important role in the game as he is Link's main source of transportation. He also turns out to be Daphnes Nohansen Hyrule, king of Hyrule. Of course, Hyrule no longer exists in Wind Waker, as it is plunged deep under water away from humanity, so basically, the King of Red Lions is not really a king. It is unknown if this was the same king that ruled Hyrule in Ocarina of Time, but I have my share in this. First of all, the King of Red Lions must have been a king at one point, otherwise he would never even been named a king. Second of all, I mentioned in a previous article that I think the king of Hyrule from Ocarina of Time died already. I think that the King of Red Lions may have ruled in the time period between Ocarina of Time and Wind Waker, but as he has abnormal powers, he turned himself into a boat under an alias name when the Great Flood happened. So all in all, I say no, the King of Red Lions was not the king in Ocarina of Time. Another theory about the King is that he dies at the end of Wind Waker, and I support this. He clearly drowns in the water, he looked like he lost hope to live, too. So I think it's pretty clear that he dies. So did I make up for the last article? I hope I did. Anyways, another important announcement I have is that I am currently looking for News Writers and Walkthrough Writers. Anyone interested, please contact me. The Zelda Realm need new staff with our growing popularity (we hit 3000 views today), and you could be a big contributor. So apply now! Welcome to The Zelda Realm, where you can find anything Zelda-related, from the latest news to great theories! Make sure to check us out on YouTube for more great walkthroughs and videos, or on Twitter for regular updates regarding the site. If you have any questions or concerns, don't hesitate to contact us here, or read the FAQ or About Zelda Realm page. Enjoy your stay! The Zelda Realm. Powered by Blogger.